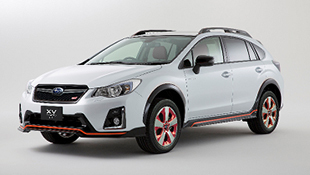 Tokyo, July 28, 2016 – Subaru Tecnica International (STI),* the motorsports division of Fuji Heavy Industries, started to take pre-orders of the “Subaru XV Hybrid tS” on July 28. 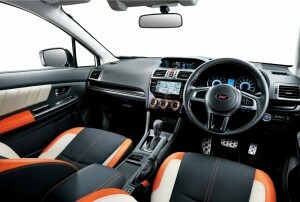 The model will go on sale this fall through Subaru dealerships in Japan. Taking the Subaru XV Hybrid as its base, this complete car from STI features exclusive suspension tuning as well as distinctive exterior and interior design. The car has been developed with the goal to offer a feel-good experience in all road conditions and better driving skills to everone who drives it. Handling performance and a high-quality ride are both achieved at a high level by the addition of original STI components including a flexible tower bar, STI-tuned dampers, coil springs and rigid clamp stiffeners. Special design elements serve to heighten driver anticipation and the joy of ownership. On the exterior these include orange highlights running from the front under spoiler over the aluminum wheels and side under spoilers to the roof spoiler while the interior features exclusive seats in the black leather/black Ultrasuede® combination with STI logo and orange stitching. * Available at additional cost of 32,400 yen (including consumption tax).